The life of a princess is not all glamour, handsome princes, and beautiful clothes. It is also devotion to duty, sacrifice for your people, and a lot of just plain hard work. And if your country happens to suffer two world wars and a communist takeover in your lifetime, it means danger and suffering, exile and heartache as well. 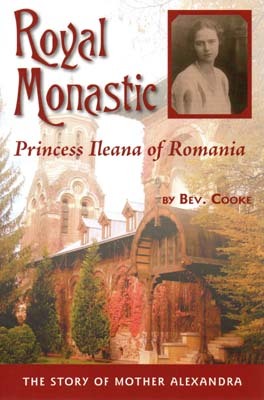 Princess Ileana of Romania endured all this and more. But her deeply rooted Orthodox faith saw her through it all, and eventually led her in her later years to the peaceful repose of monasticism. But that life included sacrifice and hard work as well, because as Mother Alexandra she was called to build the first English-language Orthodox women’s monastery in the United States; the Monastery of the Transfiguration in Ellwood City, Pennsylvania. Princess Ileana’s story is a thrilling tale of love and loss, danger and rescue, sacrifice and reward. Her inspiring life stands as a beacon of faith and holiness for young women of all times and nations to follow.